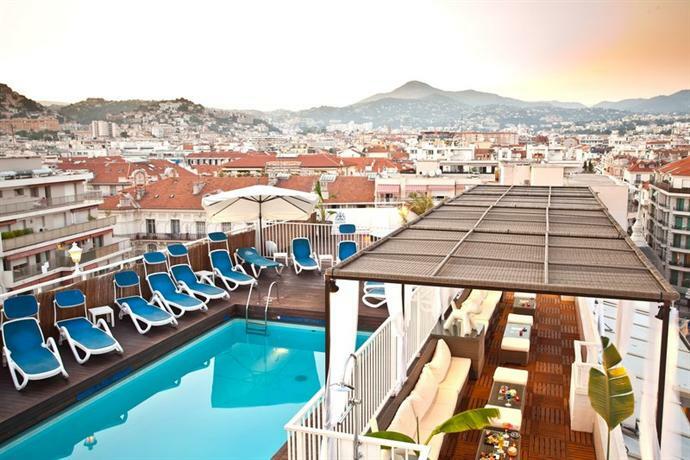 Located on the 8th floor of the Splendid Hotel and Resort the outdoor rooftop pool offers skyline views of Nice and the Alps in the distance. The seasonal pool features nylon chaise loungers, a wood pool deck, shade cabana's with soft wicker furniture, whirlpool tub, evening lighting, and a pool side bar known as L’EssenCiel bar. L’EssenCiel features a variety of alcoholic and non-alcoholic beverages including indigenous beers, classic cocktails as well and craft cocktails. Th bar is open daily 7:00 a.m to 12:30 a.m. Access to the pool is free of charge to hotel guests. The seasonal pool is open from April to October.